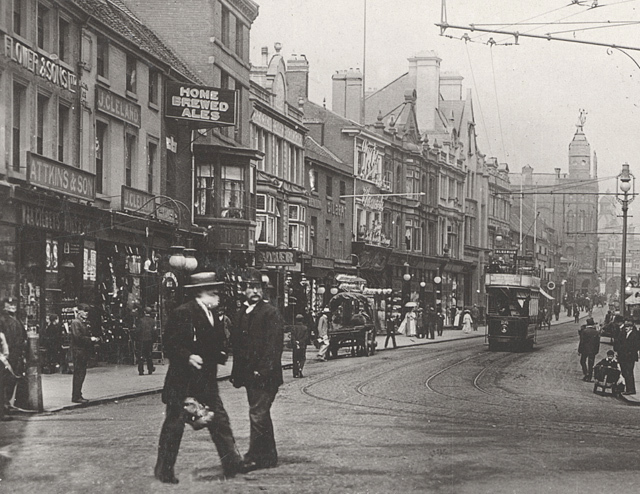 The grocers of Attkins & Son of 5 Park Street is on left side of this photograph taken around 1906. Other business names visible are John Cleland’s a boot and shoe maker, Flower & Sons Ltd., Boots The Chemist and the building to the left of the tram is Ralph Richman’s drapery store. One thing that always intrigued me as a lad was the window that protruded onto Park Street from the New Inn by the ‘Home Brewed Ales’ sign, it was a good 10 or 12 feet in front of the building line! In the distance the Grand Theatre before it lost its tower and in the far distance, Her Majesty’s Theatre. I also like the lad on the far right sitting on some kind of little trolley. One of the secrets of success in business is location and George Attkins certainly got that correct when he chose Park Street as the base for his grocery business which he started around 1875. George was not a native of Walsall, he was born in Stony Stratford, Buckinghamshire in 1825. Sixteen years later he was listed in the 1841 census as a grocer’s apprentice in his hometown. It would appear he tried his hand at drapery for a short time but realised his destiny lay in the grocery business as the 1871 census lists him having his own grocery business at 39 High Street, Potterspury, just up the road from Stony Stratford. An advertisement for Attkins & Son from The Walsall Ladies Book of Recipes published in 1905. What brought George, his wife Angelina and five of their seven children to Walsall is unknown but the 1881 census has them listed at 3, 4, and 41/2 Park Street, yes they did do halves in those days! Assisting George in the business was his eldest son, Henry Donatus Attkins, born in 1856. The business was doing very well as George was now in nearby Sutton Coldfield running another grocery shop at 50 The Parade, his son Henry was firmly established in business at 5 Park Street, no more halves to worry about! The premises were described as a modern shop with three large display windows with spacious stores and warehouses to the rear. The business had large stocks of groceries and provisions, specialising in best butter, home cured ham, cheese, bacon etc. Attkins were also known as stockists of Italian warehouse goods, this meant they stocked olive oil, nut oil, macaroni and vermicelli etc., in fact anything from Italy. It wasn’t only food they were known for, they were also agents for W. & A. Gilbey’s wines and spirits, Guinness Stout as well as Bass and Allsopp’s Ales. Business really was doing well as they now had another shop on the corner of Westbourne Street and Butts Road. In the 1901 census Henry was now living in Persehouse Street in a property called the White House. Ten years later he was living in a nine roomed house also named White House but in Arboretum Road. It was in fact the same house, it was the street that had changed. Originally Persehouse Street ran from where it is today across what we know as Broadway North and continued into what is now Arboretum Road. It was decided to give the road a separate name when it was clear it could go no further due to the Arboretum. In 1900 George Attkins died aged 75 at his home in Manor Road, Sutton Coldfield, leaving just under £5000. 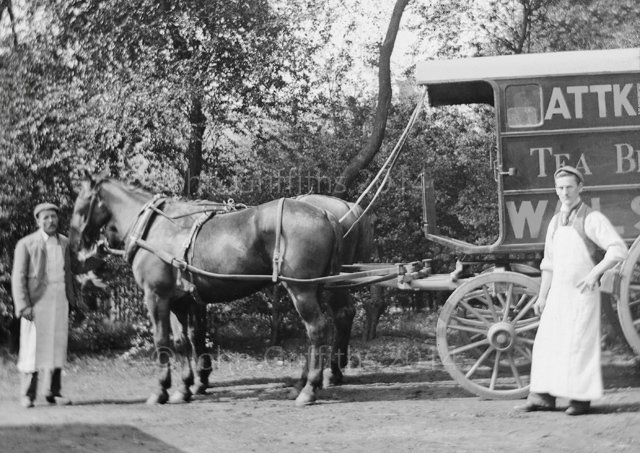 Henry continued running the Walsall shops and of course by now had his own horse-drawn delivery vans as seen in the photograph. 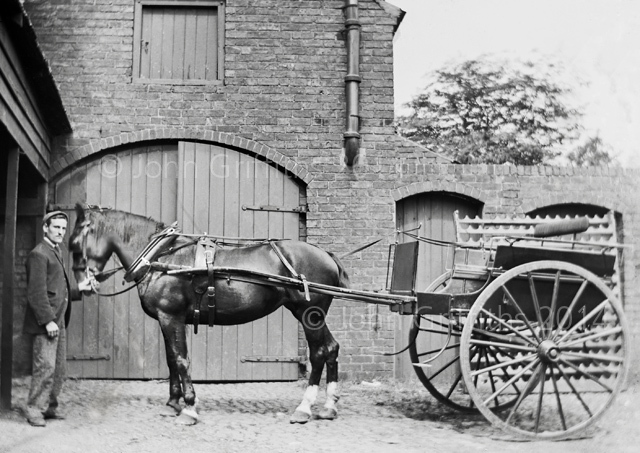 The other photograph shows their private transport, a pony and trap. I presume the chap holding th’osses in both pictures is none other than the gaffer himself, Henry. Where these two photographs were taken is a bit of a mystery, probably at the rear of Henry’s home by the amount of shrubbery around or possibly at the rear of the Westbourne Street shop. Both photographs were taken by Henry’s friend, Arthur Farrington, a Walsall Photographic Society member who was chief cashier at Eyland & Sons Limited. Arthur took other photographs of Henry Attkins and his family but unfortunately the glass negatives have been damaged by water and damp as they were stored for many years in a cellar. The two ‘oss power company delivery van. The private ‘runabout’ of one ‘oss-power. In November 1915 Henry Donatus Attkins died at his home, which was now in Gorway Lane off Gorway Road, aged 59. It was to be a sad year in the Attkins household as Henry’s second eldest son, Leslie, was killed in France whilst serving with the Queen’s Victoria Rifles. The business was taken over by Henry’s eldest son, William Henry who remained in charge for many years until his death in 1957 aged 71. A 1960 trades directory still has the business listed at 5 Park Street but it was not long after that the name Attkins disappeared from Park Street after almost 85 years of trading. 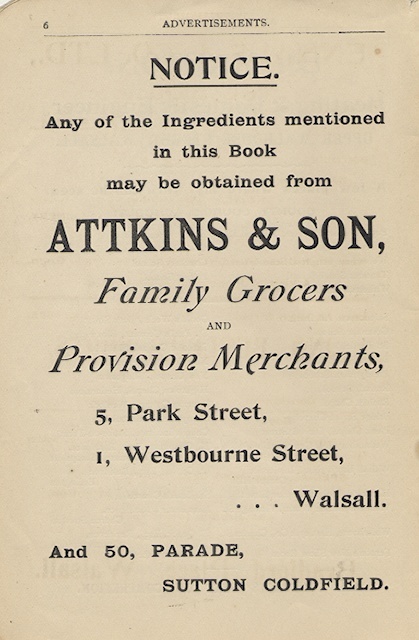 You are currently reading Attkins & Son, Grocers of Park Street at Walsall Life.